Listen, everyone dreams about it sometimes. You know, the doomsday machines, the death rays, the deadly schemes to take over the entire world. Deep down, we all sort of want to be a mad scientist bent on crazy acts. Of course, we usually don’t act on those weird daydreams, but now, with this Nefarious Board Game, you can indulge in some of your more nefarious qualities! This board game comes with a game board, along with various cards and spy figurines to play the game. 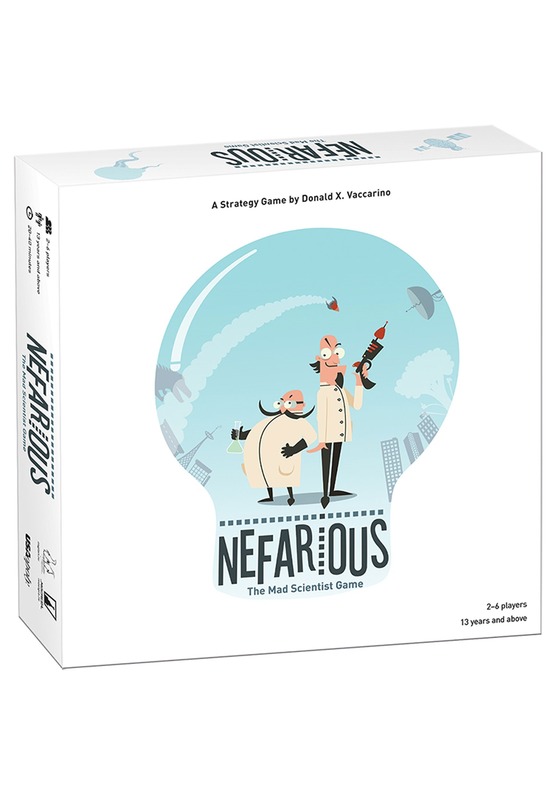 The game is designed for 2 to 6 players and places you in the role of a villainous mad scientist! You and your friends will frantically command your minions to obtain money, create blueprints, and build some of the most amazing inventions that the world has ever seen! Will you be the first to construct a working freeze ray? Or perhaps you’ll focus your efforts on creating a robotic dinosaur pet that’s ready to rampage through the city? The first player to reach 20 points worth of inventions wins the game and becomes the ruler of all mad scientists (or at least that’s how we play). If you need a way to unleash your inner villain, then it’s time to try your hand at playing the Nefarious Board Game.